Jim Wedaa, originally from Yorba Linda, California, attended the School of Motion Pictures and Television at UCLA and received a Bachelors Degree in 1987. Jim began his career in 1988 at Weintraub Entertainment Group in the Story Department. Transferred during the writers strike to the marketing department, Jim worked on campaigns for such films as Luc Besson’s THE BIG BLUE. Jim soon left to return to the creative fold and was hired as a production executive at Hollywood Pictures, a division of the Walt Disney Studios. Working under Jeffrey Katzenberg and Ricardo Mestres, Jim supervised such films as director Curtis Hanson’s THE HAND THAT ROCKS THE CRADLE, Jerry Bruckheimer’s DANGEROUS MINDS (starring Michelle Pfeiffer), THE AIR UP THERE (starring Kevin Bacon), Director Taylor Hackford’s BOUND BY HONOR, JUDGE DREDD (with Sylvester Stallone) and THE COLOR OF NIGHT (Starring Bruce Willis), among others. Leaving in 1994, Jim formed his own production company, The Parallax Corporation. Through Parallax he sold fifteen projects to various studios and produced such movies as the Universal release BLACK DOG (starring Patrick Swayze and directed by Kevin Hooks) and the independent CRIMSON CODE with Patrick Muldoon and Oscar winner Cathy Moriarty. In 1996 Jim joined the Jacobson Company as Head of Production where he was in charge of acquiring, developing and packaging motion picture and television projects. In 1996 Jim was named by screenwriting magazine FADE IN as one of the “One Hundred Most Important People Everyone in Hollywood Needs to Know.” In 1997 The Hollywood Reporter included Jim in its annual feature “Hollywood -The Next Generation” which honors 35 people in the movie business who are anticipated to be future industry leaders. At the Jacobson Company Jim was a Co-Producer on the Brian DePalma science fiction film MISSION TO MARS (released through Touchstone Pictures and starring Tim Robbins, Gary Sinese, Don Cheadle and Jerry O’Connell) and executive-produced the comedy, BIG TROUBLE. Directed by Barry (MEN IN BLACK) Sonnenfeld and based on the book by Pulitzer winning journalist Dave Barry, the film starred Tim Allen, Rene Russo, Omar Epps, Johnny Knoxville, Tom Sizemore, Jason Lee, Patrick Warburton, Andy Richter, Dennis Farina, Stanley Tucci and Janeane Garafolo. BIG TROUBLE was released by Touchstone Pictures. While at the Jacobson Company Jim founded the television division where he created and executive-produced numerous half hour filmed comedies and one hour dramas, packaged them with writers and sold seven of them to various networks including CBS, ABC, NBC, VH1 and MTV. 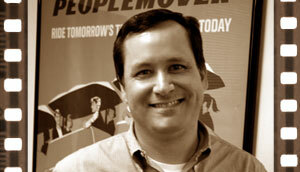 In 2010, Jim founded a second company Parallax Talent Management. Through Parallax Jim represents Oscar nominated and Emmy winning writers and directors working in features, television and digital mediums. Learn more about Parallax by visiting our website. Jim is a member of the Producers Guild of America, the Writers Guild of America, the Academy of Television Arts and Sciences, and the charitable organization Council for the Next Generation. Additionally, Jim has served as a judge for the UCLA Film Festival and currently serves as a judge for the UCLA Screenwriting Contest.